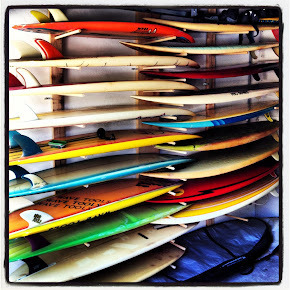 : Board Collector: Outerknown / Surf Shacks. Kelly Slater was in town recently for the launch of his new label 'Outerknown' in OZ. I was chatting with him and his partner, my good freind, John Moore and Outerknown Content Editor Zak Bush. It was suggested that it might be a nice idea to have Zak come over and have a look at my board collection and our little surf shack on the weekend. I was stoked to be able to show Zak some of the Coal Coast and because it gave me a chance to pull out some of the boards from the collection from where they are stashed around the place. Moving outside of an urban environment can be tough when you’re constrained by the day to day routine of a 9-to-5. It’s families like Damion and Fern’s who appreciate having access to nature that make it happen. I trekked down from Sydney the other week to check out their pad, an A-framed tree house that’s practically bursting with creativity. Nestled in a grove of trees and backing onto an enormous national forest, these two and their son, Jake, seemingly have it made with a perfect blend of urban bustle and rural seclusion. How did you guys end up living an hour outside of Sydney, next to Royal National Park? 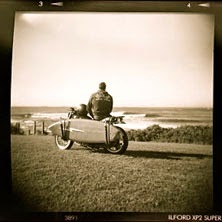 Damion: We are very lucky to have had the opportunity to live in both Australia and the USA. Before we moved I used to complain about a lot of things in OZ, it took moving to California to open my eyes to the great things about Australia: the space, the light, the air, the clean water, empty beaches and an abundance of waves. As soon as we returned to Sydney I knew I didn’t want to be in Bondi anymore and we started looking around my favourite reef and point breaks on the south coast. We found ourselves a cedar A-frame cabin that was built as a writers retreat in what was once a coal miner village in the Royal National Park. Do you feel like where you live is remote? DF: It certainly feels remote, which is really wonderful, especially on the weekends. In reality you can get a train from the station at the end of our street and be in the centre of Sydney in 50 minutes. The closest wave to our house is a reef break that’s a 15 minute hike down a cliff to the beach. When you’re out there in the ocean staring back at the rain forest you can be mistaken for thinking your many miles from civilization. 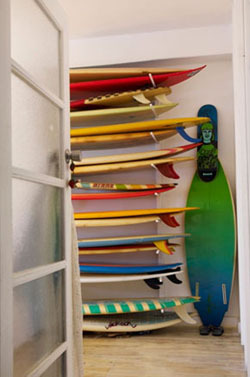 When did you start collecting surfboards? 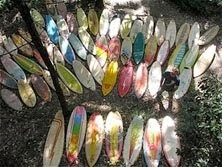 DF: I didn’t decide to start collecting, but old surfboards started finding their way to my place about 20 years ago. 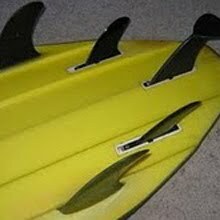 The first ‘old’ board I bought was an old twin fin that was identical to the first board I had when I was 11 years old. 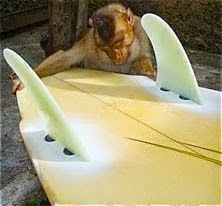 When I saw it for sale in a junk shop I had such a rush of profound memories of the first waves I had on that board that I wondered if the board would ride as well as I remembered. From there I started wondering about the viability of the designs of other boards in the thrift stores that had drifted out of fashion and I started buying those too. 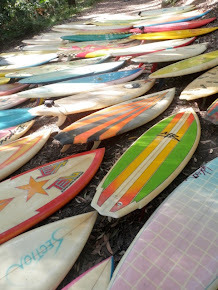 Why do you collect so many old boards? DF: I like to think that my collection is actually pretty focused. 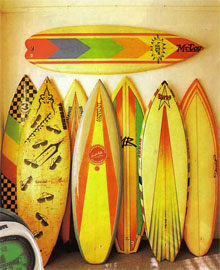 I’m interested in a very particular period of surfboard design, from 1978 to 1983. 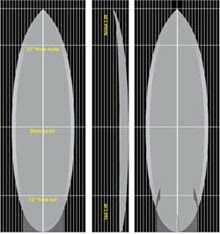 Some people call this period the innovation period of surfboard design because before ‘78 surfers were mainly riding single fins and after ’83 most surfers were on thrusters. 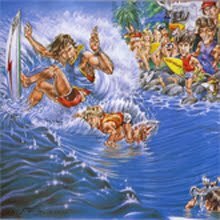 But there was this explosive period of design experimentation for a few years where many of the pro-surfers were also shapers. A good snapshot is the 1982 Stubbies contest at Burleigh Heads. 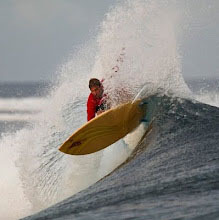 The heats included Mark Richards on his own hand shaped twin fin design, Cheyne Horan (winning) on a Geoff McCoy Laser Zap design with Ben Lexan designed winged star fin, Rabbit Bartholomew on a channel bottom rounded pin tail Hot Stuff, Dane Kealoa on a no rocker T&C twin fin, Glen Winton sitting on the rocks with a piece of sandpaper adjusting the foil on his quad fin and Simon Anderson on his new 3 fin thruster design that would go on to dominate the sport. 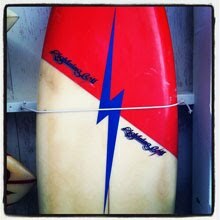 Never before or since has there been such a variety of cutting edge surfboard designs in one place. 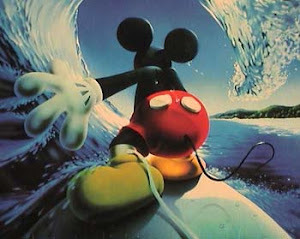 There are so many examples of design innovations from that period that I want to try I’ll probably end up with 500 boards! What is Aloha to Zen and what inspired Fern to write it? 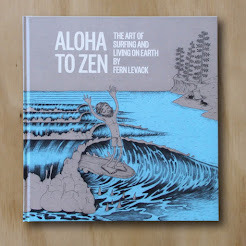 DF: ‘Aloha to Zen – The art of Surfing and Living on Earth’ is a book that Fern wrote and illustrated as a love letter to me that documents and celebrates all the idiosyncrasies of surfing and surf culture. It may have been her way to purge all the information that I had been filling her up with over the years! It was a great project for her to get into while we were in Encinitas and exposed to the deep and rich surf culture that exists in parts of Southern California. It also explores some themes of permaculture and looking after our oceans and environment, powerful themes that are important to her that come from her youth spent on the north coast of New South Wales. Any more upcoming projects for you guys? DF: I’m keen on making surfboards in my shaping studio that draw from the best design elements from my collection of vintage boards, that I combine with some modern plan shapes and bottom contours. Fern continues to paint and draw, so we are hoping we can pull it all together into an exhibition with some friends of ours in California later in the year. All photo by Zak Bush. Interview originally published on Outerknown.